Holland America Line have added three new itineraries to their 2015 line-up, meaning holidaymakers considering booking a European cruise for next year now have an even bigger range of options to choose from. The new itineraries bring Holland America Line’s total European schedule for 2015 up to 62 unique cruises. Exploring Europe next year will be the ms Eurodam (pictured above) and ms Nieuw Amsterdam — Holland America Line’s two Signature Class ships, and also the ms Maasdam, ms Prinsendam, ms Rotterdam, ms Ryndam and ms Veendam. New to Europe next year will also be the 1,916 passenger capacity ms Zuiderdam, which is scheduled to sail in the Mediterranean instead of the ship’s usual routes around the Caribbean. Richard Meadows, Executive Vice President of Marketing, Sales and Guest Programs for Holland America Line, said: “Having eight ships in Europe enables us to reach every corner of the region — from the top of Norway to the beaches of Turkey and everywhere in between. The new itineraries include an 18-day Canary Islands discovery cruise, a 14-day Northern Isles cruise, and a 21-day Mediterranean cruise which sails from Harwich, London in September. 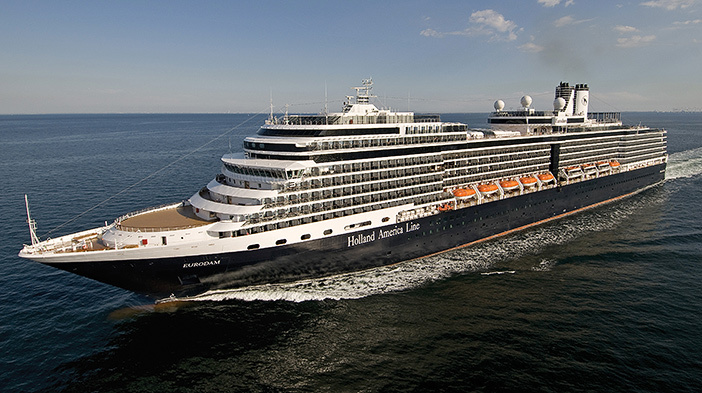 Holland America Line also recently announced that they would be repeating the success of previous ‘Dancing With the Stars’ themed cruises, with a six cruise program that will run in 2015 and 2016. The entertainment focused cruises are based on US broadcaster ABC’s hit TV programme ‘Dancing with the Stars’. Images via Holland America Line.